Understanding inflation is crucial to investing. For most investors, inflation presents the biggest risk to achieving one’s investment goals. Inflation affects all aspects of the economy, from consumer spending, business investment and employment rates, to government programs, tax policies, and interest rates. You’ve probably heard people questioning whether we are heading into an inflationary or deflationary period. What does this mean, and more importantly, what impact does it have on your investments and your future lifestyle? The inflation/deflation debate is important on multiple fronts. For investors, being right or wrong on this key issue could mean the difference between amassing a sizeable portfolio, or living your future lifestyle way below your current expectations. Simply put, inflation is the rise in the price of goods, services and taxes over a period of time. It is best understood as the loss of purchasing power. Inflation means our dollar today will buy fewer goods and services in the future. The Consumer Price Index (CPI), illustrated below, is acknowledged as the most widely accepted measure of inflation. 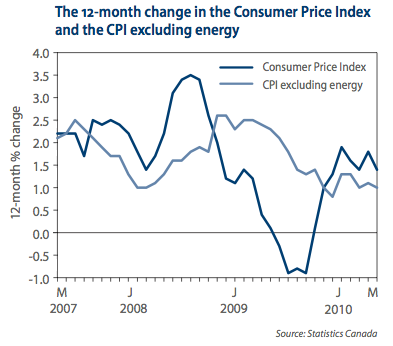 CPI measures the average change in prices over time for a certain group of goods and services. Inflation has a direct effect on our standard of living. Rising prices means we pay more for the same goods and services. If income increases at a slower rate than inflation, your standard of living declines, even if you are making more. The flipside of inflation is deflation. Deflation occurs when average prices are falling, and can result in various economic effects. For example, people will put off spending if they expect prices to fall. Sustained deflation is generally a result of a protracted economic slow-down.